PUSHING RUBBER DOWNHILL : Part 3 'A Mazungu in Al's Bar.' by AdamPiggott | DBP MAGAZINE ONLINE The World's Best Free Whitewater Publication. 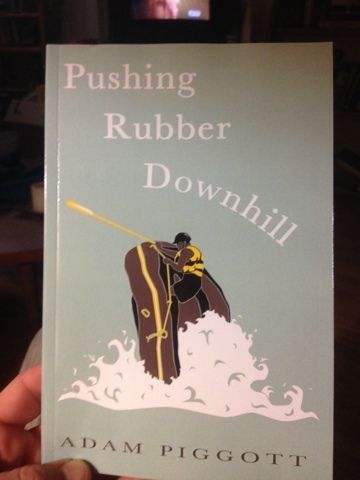 We at DBP MAGAZINE ONLINE are stoked to share with you the final excerpt from Adam’s new book “Pushing Rubber Downhill.” This last part concludes Chapter 15. You can read parts one and two in the articles posted on the previous Fridays of this month. Cheers! We ran a few more big but straightforward rapids, and then we paddled across another long pool. We pulled over to a small protected eddy on the river, right where some more local village boys were waiting for us. They hauled the rafts out of the river and carried them away on their heads. Beside us roared another impassable cataract. 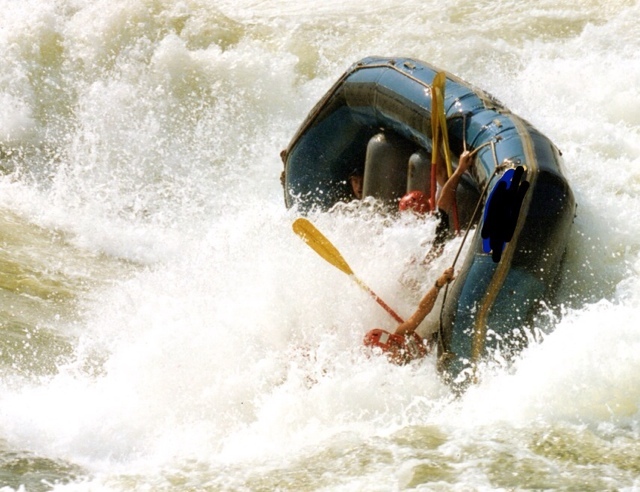 The clients followed the porters while Milo and Corey pointed out the features of Itanda rapid. Their tones were serious and their body language more subdued than before. “We don’t run that, do we?” I asked them. “It’s called The Bad Place,” Corey said. He held my gaze for a moment, and then he walked off. Milo and I followed him down a hill to where the three rafts sat in a tiny eddy. We watched Eddie’s crew climb into the raft. 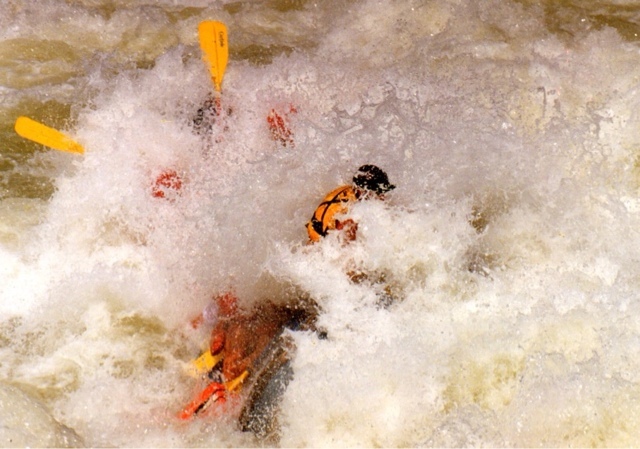 He gave them a pep talk, and then they paddled out of the eddy while keeping very close to the right hand bank. They passed an enormous hole in the middle of the river, and then they headed sharply to the left and out into a gigantic wave train. Corey brought his raft out of the eddy and followed the same line. But instead of heading out to the wave train, he squared his raft, which rose up and dropped out of sight. I saw the raft reappear, its 18 foot length vertical as it attempted to claw its way out of the hole, and then it disappeared from sight as it was sucked back into the stopper, and then the raft was surfing, the hole flinging it in violent circles while bodies were thrown around like rag dolls, until at last the stopper released its grip, and the raft floated out with its main thwarts hanging in broken pieces. We swung out into the heaving water, passed close to an enormous stopper wave, and then we rode over a rising mound and dropped into the biggest hole I’d ever seen. It stretched far above our heads, and I had a brief moment to wonder how we would ever get out before we slammed into its fury and I was thrown into the violence of the Bad Place. After suffering my second downtime of the day, we proceeded to the takeout point around the next bend. Another set of local boys man-handled the rafts up a steep and muddy track to a little village where our vehicles were waiting. The clients took photos of the village urchins as they played up for the cameras. I dumped my gear inside the bus and spotted a large cooler filled with beer and soft drink. “We can drink beer on the bus?” I asked Corey in wonder. “Welcome to Africa, bro,” he said. We got the punters into the bus and headed home for Kampala. Milo was so generous with the beer that we had to stop for further supplies before reaching the city. The bus was a mobile party making its way through coffee and banana plantations, the sun dipping in front of us, orange and purple hues bathing the countryside and towns that we passed, Corey and Milo all smiles as we celebrated my first day on the Nile. “I’ve never seen anything like this before,” I said. My comment roused Milo and Corey from their sleep. We were at the clock-tower roundabout, and the night was lit by the headlights of hundreds of vehicles crawling through the bumper to bumper madness stretched out before us. A solitary policeman attempted to direct traffic, but the drivers ignored his desperate signals as each vehicle inched forward to fill any immediate space that presented itself. Cars attempting to exit the roundabout sat face to face with those trying to gain entry. “Very bad stop this one is,” Isaac observed. “Probably caused this mess himself,” Corey said, laughing. Milo opened a front window, leaned his body halfway out of the bus, and proceeded to abuse the startled officer. I glanced at Corey in alarm, but he placed a reassuring hand on my shoulder. “Milo knows what he’s doing,” he said. As Milo’s invective increased to comparing the policeman with his own morning’s bowel movement, I noticed that Isaac was inching us forward. He placed the bus with great skill, imploring those on his side to let him through while Milo continued his diatribe at anyone foolish enough to consider coming into our path from the other direction. We left the panicked policeman behind as we negotiated our way through the dust and light beams, clearing the roundabout almost twenty minutes later. Isaac trundled along until Al’s Bar came into view. He pulled to a stop and opened the automatic side door. I followed Milo and Corey off the bus and across the road to the entrance, leaving Isaac to drive away. A couple of doormen armed with pump action shotguns stood guard outside. They nodded to Milo and Corey who presented me as the new guide. Inside was a large bar surrounded by tables and stools with a small stage set down the back. We made our way up a short set of stairs past a DJ booth suspended in the side of the wall to a long mezzanine area with a pool table and another small bar. Milo ordered a round of drinks. Even at this early hour the place was getting crowded. Hendrix wailed from over-sized speakers hanging from the high ceiling. There were around twenty African women of various nationalities grouped around the pool table. They were all astoundingly beautiful and had a collective dress sense bordering on the pornographic. They converged on us as soon as we turned away from the bar. “Are they working girls?” I asked, trying to be diplomatic. “It depends on your definition of the term,” Milo said. “They spend their time here playing pool and trying to hook up with a mazungu. You’re a mazungu,” he added on seeing my puzzled expression. The girls erupted into wild cheering whilst simultaneously trying to maneuver themselves into my arms. Milo and Corey jumped back, and the other patrons observed my desperate struggles with amused indifference. I begged the boys for some help. “You have to pick one!” Milo yelled. The girls redoubled their efforts to be the chosen one. I pointed to one at random. “Not her!” Corey shouted in warning. Corey shrugged and selected a cute girl hovering in the background. The rest of the women immediately ceased their clamoring and mooched back to their positions around the pool table. The girl hung on my arm. I tried to talk to her, but she looked at me in confusion. “I don’t get this country,” I complained. “Nobody gets this country,” Corey laughed. Dave arrived with Scott, another guide that I knew from the Tully. Scott was stocky, with long blonde hair and a missing front tooth. He’d worked in Cairns for the other company but our paths had crossed a few times when rescuing each other’s customers from sticky situations. He clapped me on the back, welcomed me to Uganda, and purchased another round of drinks. Dave went to the bar and obtained a pack of smokes. He showed them to me; they were pre-rolled marijuana cigarettes. “Cost two US dollars,” he said, winking. He walked up another set of stairs to a secluded third level where he lit up. The bar filled with a broad mix of Ugandans and expats. Some of the clients from the day’s rafting trip arrived having followed Milo’s directions. I played a game of pool against a guy who worked for the UN. The music blared, the mass of people surged around me, I drank from my glass with one of Dave’s cigarettes in my other hand, I danced with my glass above my head, the Somalian girl clung to my side, I saw Milo dancing with his arms above his head and a crowd of girls around him, I danced and drank and smoked, the lights reflecting off the back of my head, Corey yelling in my face that I was here, I was here in Uganda, I was a mazungu in Africa. EDITOR’S NOTE: If you’ve enjoyed the excerpts, you’ll LOVE the book! Go and order yours today, and look for a contest to win yourself a FREE COPY on the Dirt Bag Paddlers Facebook page next weekend!